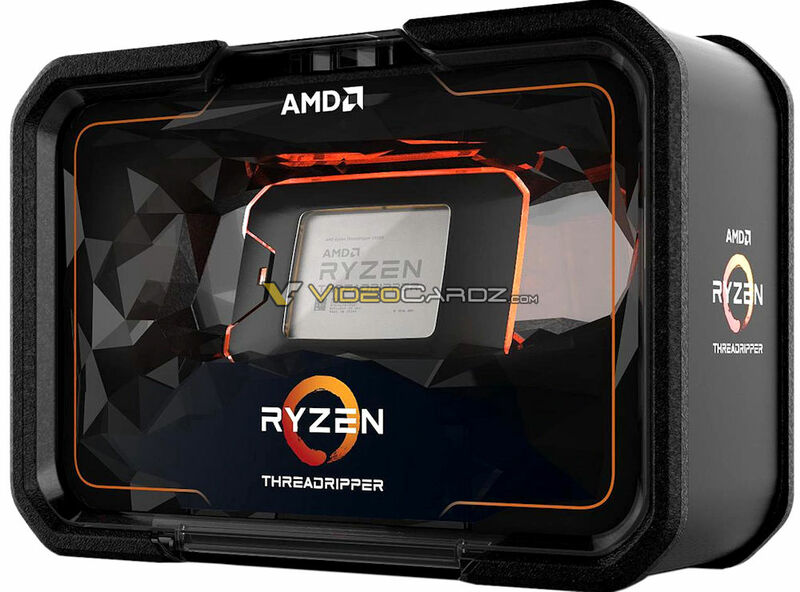 The first pictures of AMD Ryzen Threadripper 2000 series packaging have been leaked by Videocardz. The next-generation of AMD HEDT processors will be released soon and we have already got word about the specifications, but today, we get our first good look at the packaging for AMD’s high-end desktop chips. When AMD released their first generation Ryzen Threadripper processors, we got to see two new things. First was obviously the processor itself which was a disruptive product for the market, the second thing was the gorgeous packaging that the chip was shipped inside. It was a good relief from the box styled packages that CPUs had previously shipped in, but it looks like AMD is going all out with their 2nd generation Ryzen Threadripper processors. Just like the 32 core behemoth which the new Threadripper flagship is going to be, the packaging of the processor is also going to be a grand scheme of things. It’s bigger, it looks epic and like the last package, it comes with a transparent window which reveals the CPU on the front. This time, AMD has gone with a more polygonal look, which looks impressive. The back of the box has the same layout with the orange tint showing where the processor is placed. 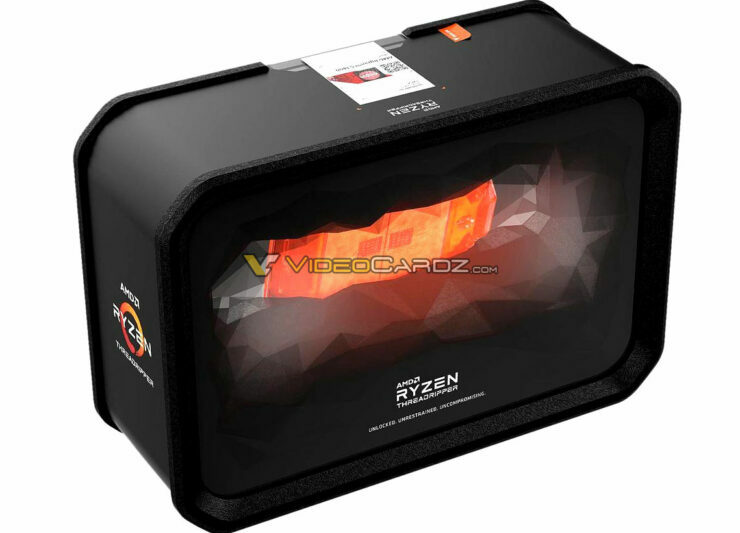 Given the room inside the box, we can tell that aside from the processor, it will ship with manuals and tools that are necessary for installing the Ryzen Threadripper processor on TR4 motherboards. 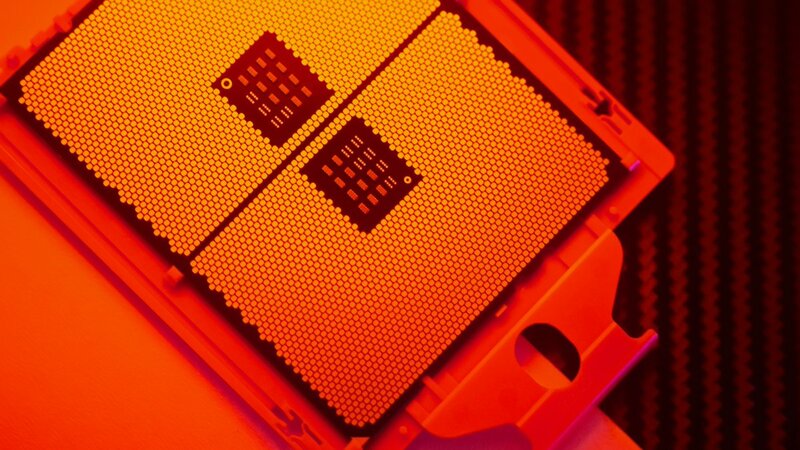 The chip will rock 32 cores and 64 threads that eclipses Intel’s halo product which will sports only 28 cores and 56 threads. The chip is expected to feature a base clock of 3.4 GHz and a maximum boost clock of 4.0 GHz while the precision boost overdrive clocks are rated at +200 MHz so expect up to 4.20 GHz in single core optimized workloads. 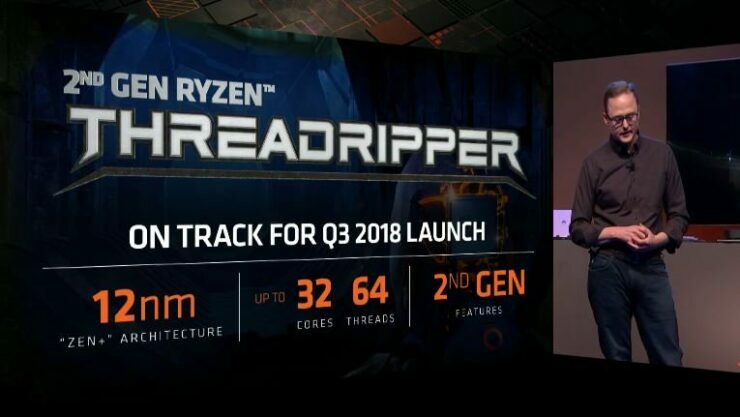 This shows that AMD can still achieve very high clock speeds even when they jumped to twice as many cores as their previous flagship, the Ryzen Threadripper 1950X. When compared to the Core i9-7980XE, the Ryzen Threadripper 2990X at around $1500 US offers better architecture based on a 12nm process, 14 more cores, 28 more threads and for $500 less since the i9 costs a grand $2000 US. 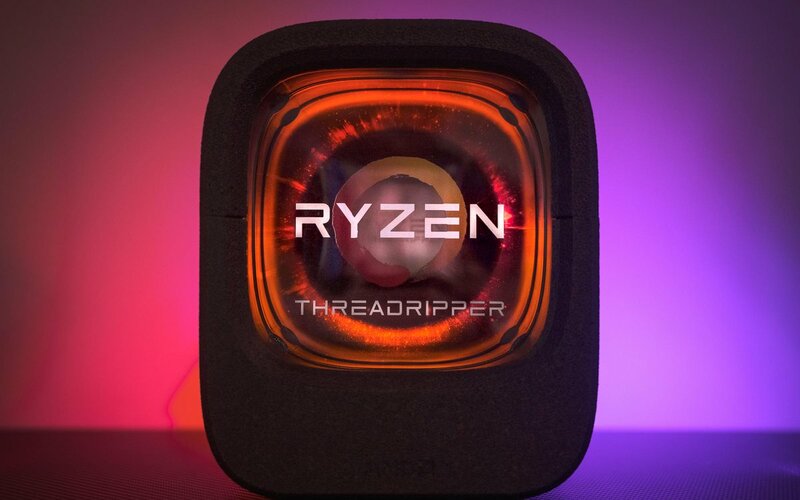 Comparing it to the Ryzen Threadripper 1950X, we get 16 more cores, 32 more threads and faster clocks at just $500 US more. The models AMD showed use the same four die CCX configuration which is being used on the current Ryzen Threadripper processors which are connected via the Infinity Fabric Interconnect. Only two of the dies are active, just like the previous parts.